Coby Electronics has just announced they will be presenting 5 new Android 4.0 Ice Cream Sandwich tablets at CES 2012 in Las Vegas. Expect different screen sizes, starting with 7-inch tablet “MID7042”, the 9-inch large “MID9042”, the 10-inch large “MID1042”. On top of that Coby will introduce 2 more slates with a 4:3 aspect ratio, which will be the 8-inch tab names “MID8042” as well as the 9.7-inch slate called “MID9742”. All tablets will sport a 1 GHz ARM Cortex A8 processor with 1GB of RAM, a capacitive multi-touch-display, wi-fi and a HDMI connection. In addition will all tablets have a memory card slot which read up to 32GB memory cards. 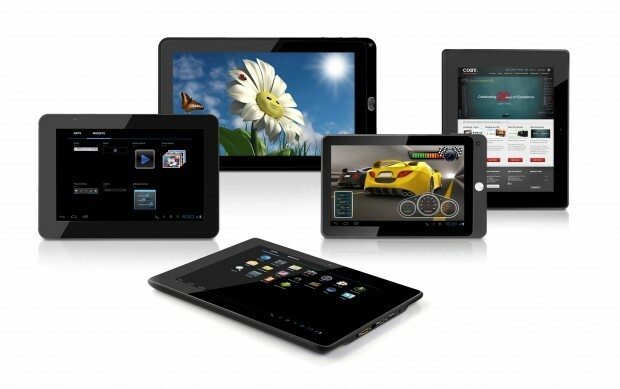 All five slates will be introduced at the International Consumer Electronics Show (CES) in the Central Hall of the Convention Center Las Vegas, starting January 10th – 13th 2012.